A screenshot of a public channel on Telegram where ISIS supporters were communicating on Friday. Islamic State terrorists are getting smarter about how they use the encrypted chatting app Telegram on their mobile phones, making it even harder for police to track them. On Friday, the private intelligence firm Flashpoint revealed that ISIS is taking new steps to make sure it's only communicating with militants and supporters -- and filter out undercover police. One U.S. counterterrorism official told CNNMoney this type of encrypted communication is posing a serious problem -- and American spies have less insight than ever. 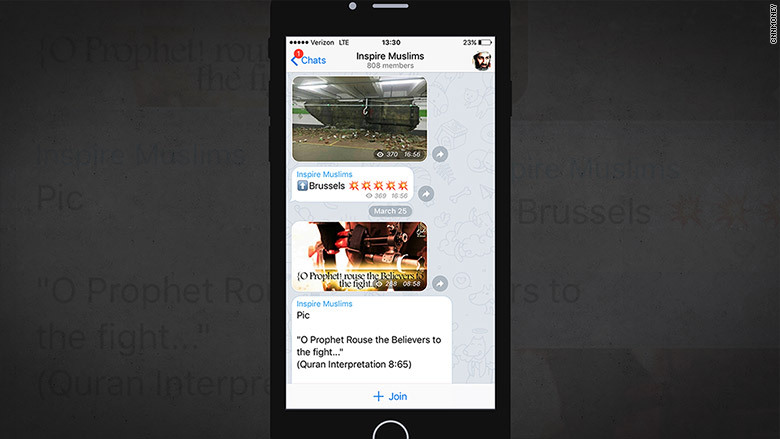 As CNNMoney has pointed out in the past, the Telegram app has become the "hot new thing among jihadists." Communication on Telegram is encrypted between smartphones, so spies can't grab all the data at once. They need to tap into individual conversations. ISIS uses Telegram's large, public channels to broadcast news about its terrorist activities. Police can monitor that. But for sensitive communications -- like teaching people how to make bombs -- ISIS is increasingly migrating conversations to invite-only channels, Flashpoint said during a phone call with members of the New York Police Department, security experts and reporters. "They include very detailed explosive manuals, advice on avoiding capture, how to deal with interrogation -- you name it. Everything from the nitty-gritty of cybersecurity to building explosives and chemical mixtures," said Laith Alkhouri, Flashpoint's director of research and analysis for the Middle East and North Africa. Flashpoint says ISIS tightly controls invitations to small, private channels. They repeat the process over and over again, and the communication circles keep getting smaller and smaller. It's meant to weed out potential government intelligence agents. "If you're not abiding by strict rules, you get blacklisted from the community and there's no way back in," said Alex Kassirer, a Flashpoint terrorism analyst. Additionally, at least one Telegram account seems to be a fundraiser for ISIS activities, according to "Gen Knoxx," an independent ISIS researcher who goes by a pseudonym to protect against jihadist violence. It's clear that Telegram is actively shutting down ISIS-linked channels. Public channels often get deleted, so jihadists are constantly on the move. But Telegram remains open. Its founder is Pavel Durov, the Mark Zuckerberg of Russia, who is determined to maintain a protected zone for free speech. Telegram did not immediately respond to requests for comment. Flashpoint also said the war on the ISIS online propaganda is yielding few results. Twitter, for instance, has ramped up efforts against ISIS: Twitter says it has suspended 125,000 accounts for "threatening or promoting terrorist acts" since mid-2015. "Has that stopped jihadists using Twitter? Not in the least," said Evan Kohlmann, Flashpoint's chief researcher. "No matter how aggressive the company gets, as long as it's easy to create a new Twitter account, there's no way of really controlling that." Twitter (TWTR) has not indicated any plans to do away with its policy of allowing people to create anonymous accounts.